This one is for those who collect San Francisco Scenes! This has been sold out for YEARS and is no longer available from the publisher or in Art Galleries. 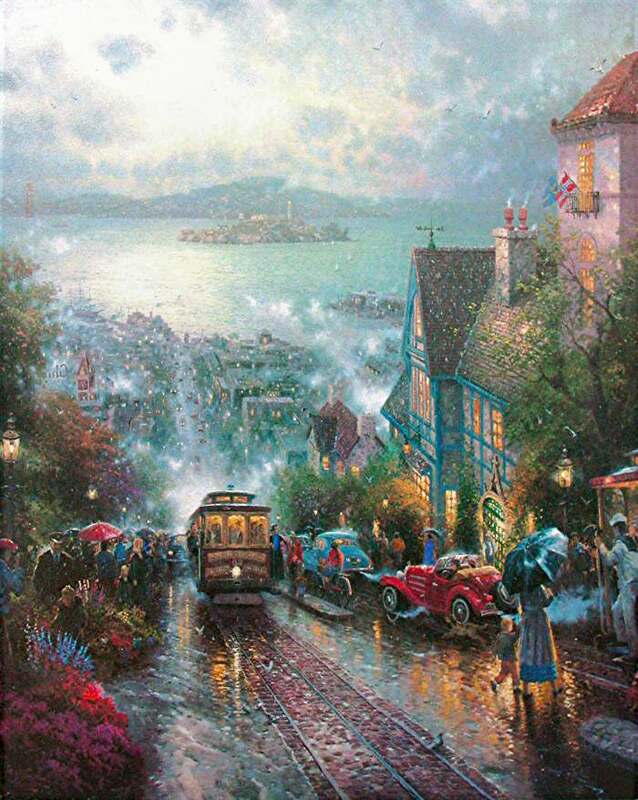 Hyde Street and The Bay, San Francisco is the seventh painting in Thomas Kinkade's popular San Francisco series. Thom lives in what is loosely called the "Bay area" about 1/2 hour from San Francisco. ++++ Tom released Hyde Street and The Bay, San Francisco in 1996. ++++ Certificate of Limitation and Authenticity included. 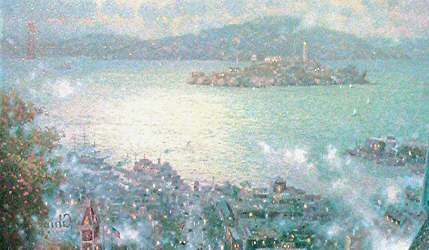 "For me, San Francisco is a city of delightful memory. When I, a small-town boy, first visited the City-by-the-Bay with my dad, I was awakened to the excitement of city life. I have been an admirer of urban communities ever since. And images from that first visit have been a source of continuing pleasure. How well I remember riding the Powell Street cable car all those years ago, rounding a corner, and first glimpsing the magnificent panorama of the bay as the track plunged down Hyde Street toward the end of the line. There, at the turn-around, was the bustle of street life - performers and musicians gathered to entertain the waiting riders. I remember the famous Ghiradelli Chocolate sign, the vibrant activity on Fisherman's Wharf, the dramatic presence of distant Alcatraz Island. But most of all, I remember the vast expanse of the bay in all its glory. My Hyde Street and the Bay, San Francisco heightens the nostalgic sense of fond memory by placing vintage cars on the street and historic ships at anchor in the bay. The bustling energy of San Francisco seemed alive to me as I worked on Hyde Street and the Bay, San Francisco. 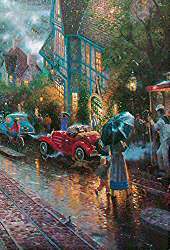 I could almost sense a brisk breeze blowing up from the bay, a subtle taste of salt air, and the enchanting clang of the cable cars as they made their ponderous way up Hyde Street hill." 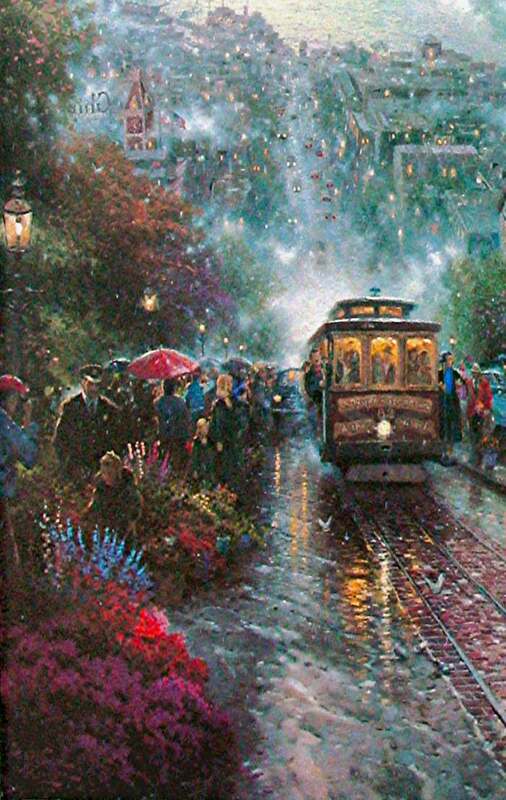 ~~~The driving force behind the San Francisco cable car system came from a man who witnessed a horrible accident on a typically damp summer day in 1869. Andrew Smith Hallidie saw a horse- drawn streetcar slid backwards under its heavy load~~The steep slope with wet cobblestones and a heavily weighted vehicle combined to dragged five horses to their deaths. ~~Hallidie had been born in England and moved to the U.S. in 1852. His father filed the first patent in Great Britain for the manufacture of wire- rope. As a young man, Hallidie found uses for this technology in California's Gold Country. He used the wire-rope when designing and building a suspension bridge across Sacramento's American River. He also found another use for the wire-rope when pulling heavy ore cars out of the underground mines on tracks. The technology was in place for pulling cable cars. ~~~For years, San Francisco has been collecting old trolley cars from various cities throughout the world, under the auspices of the Market Street Railway. Previously brought out only during the summer and on special occasions, these historic vehicles now have their own line, the F-Castro line, which stretches from the Castro District, down Market Street, along the Embarcadero and ending up near Fisherman's Wharf.